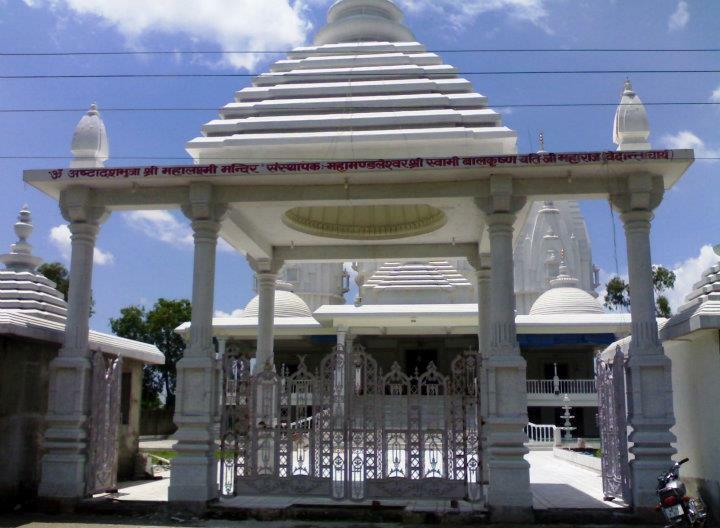 One of the famous Hindu religion temple to visit in Jabalpur district is Tripur sundri temple. This is one of the famous temple to visit in this region. 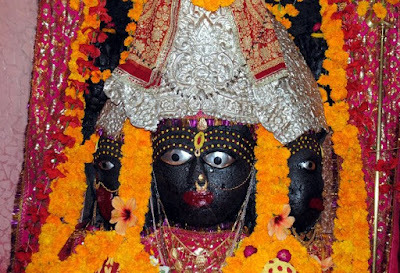 This temple is located about 13km from district headquarter Jabalpur Madhya Pradesh. 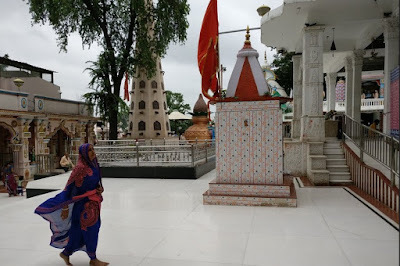 This temple is located at Tewar a village bheraghat road near Jabalpur.Here is some fact aboutTripur Sundari Temple in tewar Near Jabalpur Madhya Pradesh India. How to Reach by Road: There are many public and private vehicals available reach here.Nearest Bus stand is Jabalpur Bus stand and Medical Bus stand Jabalpur. 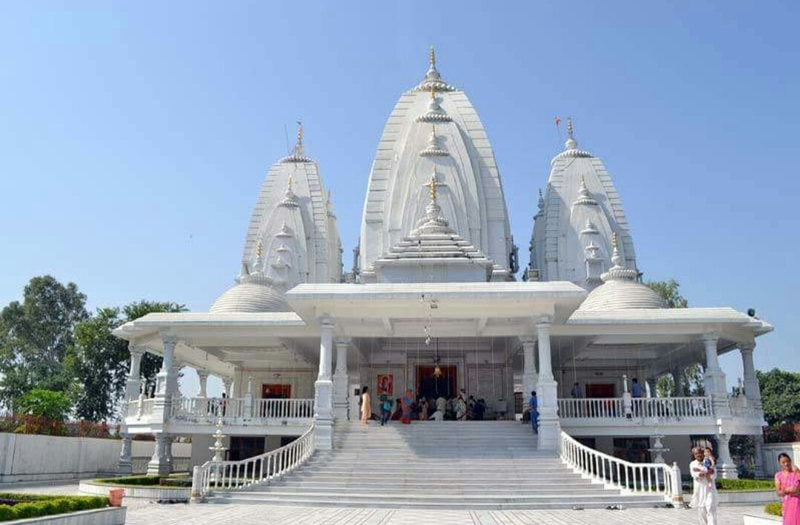 Temple of Tripur Sundari, which was situated at the Tewar village, on the banks of the Narmada, approximately 13 kilometers on NH 12, away from the Main Jabalpur City. The temple was built in 11th century.The temple is dedicated to Goddess Tripur Sundari.It is said that the statue of Devi (goddess) emerges from ground. The word Tripura Sundari denotes "the beautiful goddess of three cities".It’s a modern temple Klchuri Tripur beautiful statue is gorgeous carpet.The idol of deity Tripursundri is come out from earth. 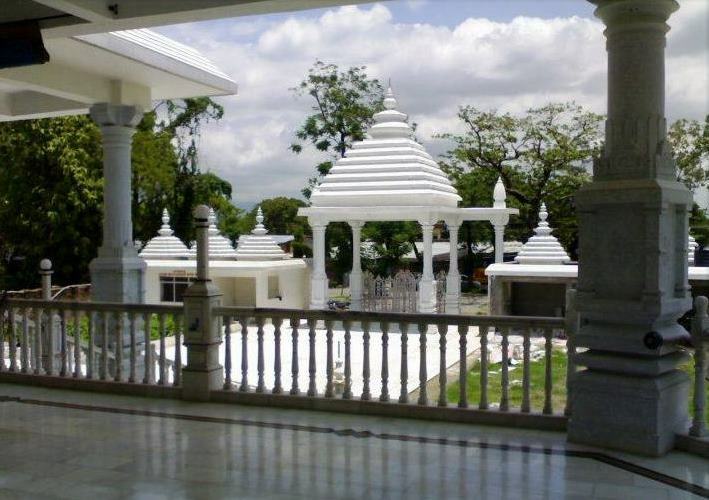 The natural environments all around of this temple increases the beauty of this temple many times. 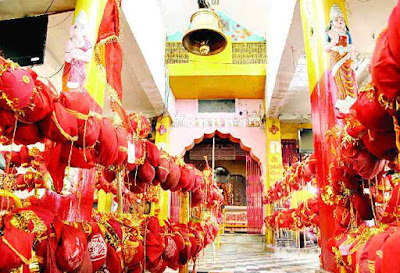 On entering temple,one is awed with the play of red and gold all around.oconuts wrapped in red clot are tide in every nook and cranny, presenting an intriguing sight.These are tied by devotees in hope that their prayers will be answered. Tha main image in the Garbhagriha is of a three headed goddess, representing Durga, Kali and Saraswati.Daily around noon, the otherwise serene atmosphere of templesuddenly reverberateswith the rhythmic drumming of Dhols and the sound of the Bhog(Prasad).The temple complex also includes a Yagna Shala,Where Yagna are performed. As this temple is totally dedicated to the Hindu Goddess, the main attraction of this temple is the Durga Puja which performed in 10 days and Dussera Festival. 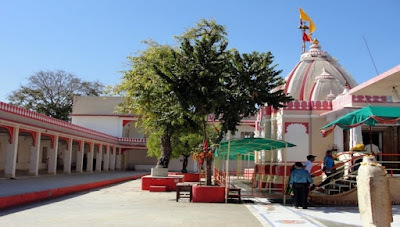 A fair is also held in the premises of this temple on the auspicious nine days of navratri.This divine place is the center of the attraction for the sacred saints and pundits. 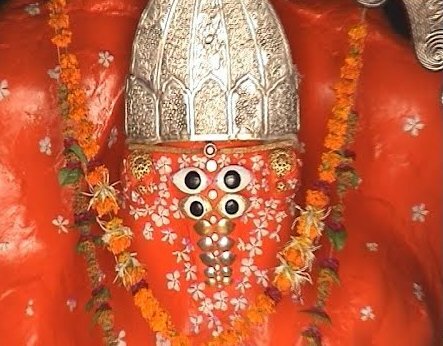 Khajrana Ganesh temple is a popular temple in the heart of Indore Madhya Pradesh.Here is some Fact about Khajrana Ganesh Temple in Indore Madhya Pradesh India. How to Reach by Air:The Nearest Airport is Indore City Airport(11 KM). How to Reach by Rail:The Nearest Railway station is Indore City Junction Railway station. How to Reach By Road: There are many public,private and governments vehicals available to reach here. 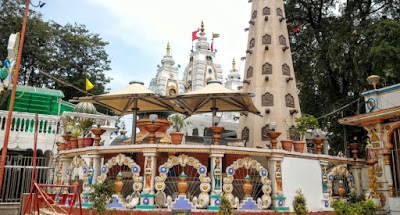 Khajrana Ganesh Temple is located in Indore City of Madhya Pradesh.The temple was built in 1875 and built by Rani Ahilyabai Holkar to safeguard the idol of Lord Ganesha from Aurangzeb during Maratha Empire. The temple is dedicated to Lord Ganesha.The enormous statue of Ganapati is an important pilgrimage destination for all tourists who visit Indore and devotees gather to offer their prayers at this temple especially on Wednesdays and Sundays.Although the Khajrana Ganesh Temple has been presently taken over by the government, yet the shrine is managed by the Bhatt family.As per a local belief, all the wishes of the devotees are fulfilled, once they worship in this temple. 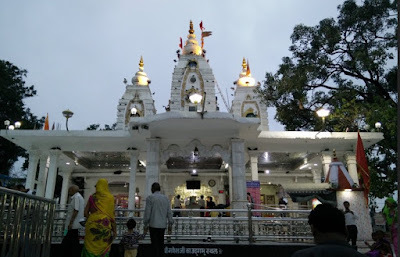 The gate, the outer and upper walls of the Garbhagriha are made of Silver and different moods and festivals are depicted on it.The idol of Lord Ganapati is made up of a mixture comprising of limestone, jaggery, bricks, mud and the soil and water brought from all important pilgrimage destinations. The deity is believed to generate positive energy on the devotees.The eyes of the Ganapati idol are made up of diamonds and it was donated by an Indore businessman. There are stalls selling prasad for offering at the entrance and a decent parking lot.Large numbers of devotees gather here on Wednesdays and Sundays to offer their reverence and prayers.The festival of Vinayak Chaturthi held in the month of August/September is celebrated with great fervor here.Prasad consists mainly of sweets, fruits, and coconuts and is available for pilgrims after 12 P.M.The main focus of this fair is the Khajrana Ganesha Temple.The temple area is clean and the surrounding is peaceful. 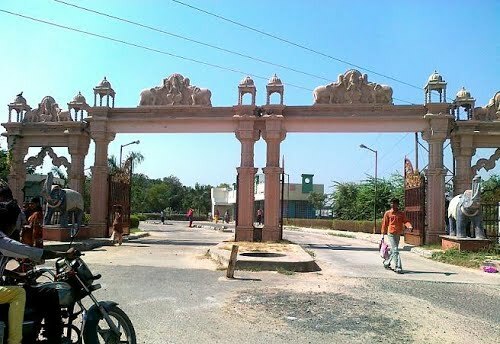 Lakhapat village is located about 80 km from Bhuj, the main city of Kutch district.The village lies surrounded by hills on both banks of a small stream and has a temple dedicated to Ashapura Mata, the household deity of former Jadeja rulers of Kutch State. 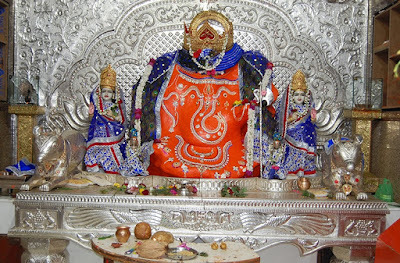 Ashapura Mata temple known as Mata no Madhn all over country.Here is some face about Mata no Madh Ashapura Mata temple in Lakhapat taluka Kutch Gujarat India. 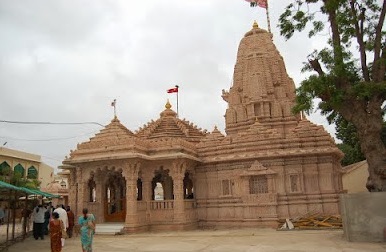 Location: Lakhapat Taluka near Bhuj Kutch,Gujarat. Re built: After earthquake in 2001. Built by: Two Karad Vanias- Ajo and Anagor. 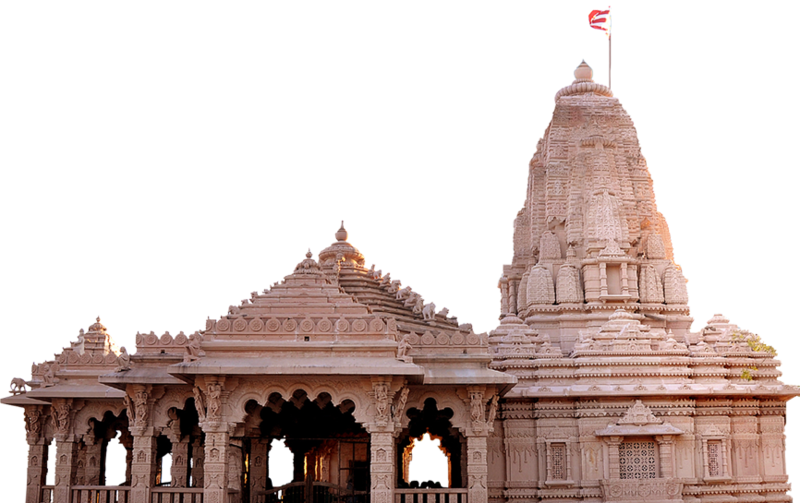 Significance: One of the best temple in Kutch District. Main Attraction: Six feet high red-painted stone statue of Ashapura Mata. How to Reach By Air: The Nearest Airport is Bhuj Airport(95 KM). How to Reach by Rail:The Nearest Railway station is Bhuj.(95KM). How to Reach by Road:There are many public and private vehicles available to reach here. 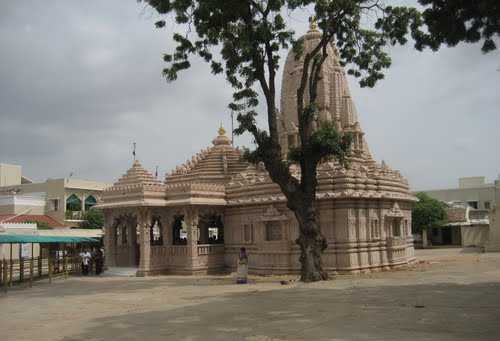 Mata no Madh situated where the famous temple of Ashapura Mata, the head deity of Kutch stands at 95 km from Bhuj in Lakhapat Taluka.The templeis dedicated to Goddess Ashapura.The temple was built in 14th Century and built by two Karad Vanias, Ajo and Anagor. They were the ministers in the court of the father of Lakho Phulani. The temple was damaged by the earthquake in 1819. The temple was rebuilt by Sundarji Shivji and Mehta Vallabhaji, two Brahmakshatriya in 1823 (Vikram Samvat 1880). The temple is 58 ft. long, 32 ft. wide and 52 ft. tall. Inside the temple, one can see a six feet high red-painted stone statue of Ashapura Mata. People of many communities gather at the temples for her ‘Darshan’ all the year round, particularly during the ‘chaitra’, and in greater numbers during the ‘Ashvin’ Navratri. 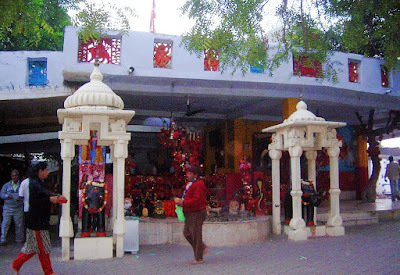 During the festival, puja is performed on a large scale; everyone from erstwhile rulers to locals takes an active participation in the festival.In this festival many pilgrims of Gujarat go to mata no Ashapuri Temple madh by walking from various places and feel that they are lucky enough to have this opportunity. Even they go to mata no madh Ashapura temple by bicycle from different states of india. The goddess fulfills all the desires. She is adored as a Kuldevi of the people of Kutch. During navratri the fair is organized at mata no madh. Many devotees come to worship the goddess around the world. Mobile : +91.98250 15353 (Mr. Khengarji V. Jadeja). Lambha is a Locality in Ahmadabad City in Gujarat State of India.Here is Information about Baliyadev Temple known as Baliyakaka Temple in Lambha Near Ahmedabad Gujarat India. How to Reach by Air: The Nearest Airport Sardar Patel International Airport Ahmedabad. How to Reach by Rail: The Nearest Railway station is Vatva Railway station. How to Reach by Road: There are many public and private vehicles available to reach here.AMTS Bushes available. 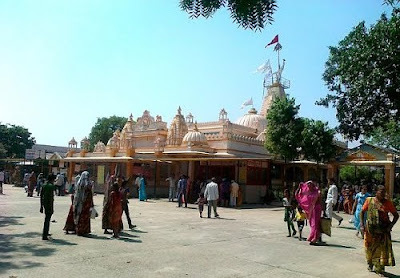 Baliyadev temple is located Lambha town within 11 Km of Ahmedabad city.The temple was built in 1996.The temple is dedicated to Lord Baliyadev.The temple is known as Nava Baliyakaka temple.The temple is very popular.Many devotes come here and take blessing Baliyakaka.The 'Prasad'called 'Gundi' complated up with pure Ghee.Gundi test is verysuperb its very famous and yummy in City of Ahmedabad Lambha Temple. Temple Address ,Contact,timing,Visiting timing,Best time to visit and all Information about Baliyadev or Baliyakaka Temple . 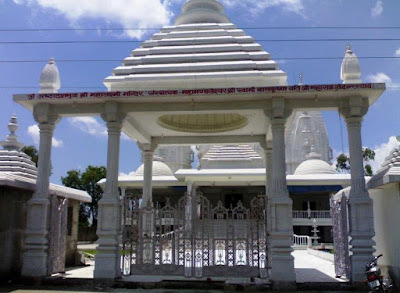 Here is Some Fact about Ashta Dasha Bhuja Lakshmi Temple in Beriparo Haldwani Uttarakhand India. 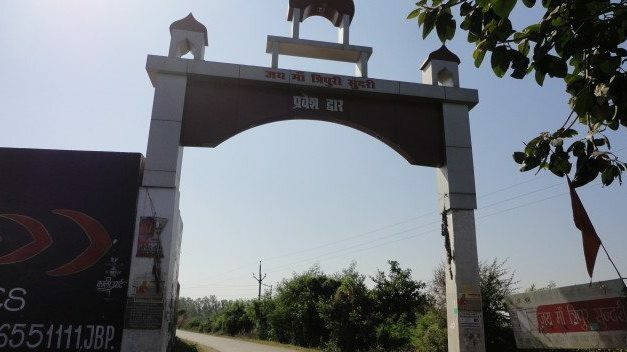 How to Reach by Air: The Neares Airport is Pantnagar airport (27 KM). How to Reach by Rail:The Nearest Railway station is Kathgodam railway station. How to Reach by Road:There are many public and private vehicals available to reach here. Aaasthbhuj Mahalakshmi Temple is located in Beriparo Haldwani Uttarakhand India.The temple was built about 1000 years ago.The temple is dedicated to Goddess Mahalakshmi.The temple is very beautiful and amazing.Many devotes come here and take blessing Goddess Mahalakshmi . Temple and visiting timing,best time to visit and other information of Ashta Dasha Bhuja Lakshmi Temple Temple. The Temple is one of it's kind in India with an Idol of Goddess lakshmi with 18 Hands, it's also one of the biggest and most visited shrines of the city. The temple is a very large structure, with three main domes of white color.Although the Ashta Dasha Bhuja Lakshmi Temple is devoted mainly to Lakshmi Ji, its also houses Temples of various respected Gods - "Lord Shiva", "Lord Ganesha" and "Lord Hanuman", the temple attracts devotees from every religion and caste.